Walking through the halls of the Court of Appeals before and after the ceremony was just like being at a family reunion. Judges who gathered for the event were smiling and laughing, hugging old friends and making new ones and sharing stories. “There is much for us to celebrate today,” said former Chief Judge John C. Martin. He was one of three former chief judges who spoke to a full room during the ceremony. He pointed out the judges’ portraits on the wall and said he was reminded of the great judges who led the way for the Court of Appeals to become what it is today. He spoke about the work of the court and about the collegiality and professionalism among the judges. 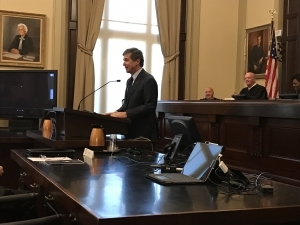 Martin said their work together led to the court being recognized as one of the most efficient intermediate appellate courts in the country at a time when the judges were some of the lowest paid in the country. Martin was referring to the General Assembly’s recent decision to reduce the Court of Appeals from its current 15 judges to 12. He was the only speaker who referenced the law specifically, though a number of the other speakers subtly addressed it. “But even in the face of that, I have no doubt this court will rise to whatever challenge,” Martin said. 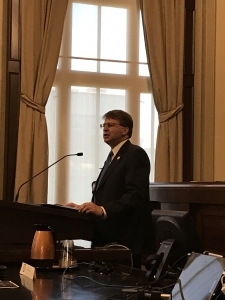 State Supreme Court Chief Justice Mark Martin said over the past 50 years, the Court of Appeals has exceeded every expectation. The court through its judges, law court and staff, he said, handles approximately 2,300 appeals per year and each judge writes over 100 opinions per year. The court renders the final decision in about 95 percent of all appeals, he added. Martin pointed out that the Michigan Court of Appeals has 28 judges, Tennessee appellate court has 24 and Ohio’s has 69. “For those who are challenged at math, I want you to observe that there are 15 judges up here for the ninth most populous state in the country, and I find that to be an amazing statistic,” he said. The state Court of Appeals is currently comprised of Chief Judge Linda McGee and Judges Wanda Bryant, Ann Marie Calabria, Rick Elmore, Donna Stroud, Robert Hunter Jr., Chris Dillon, Mark Davis, Richard Dietz, John Tyson, Lucy Inman, Valerie Zachary, Philip Berger Jr., Hunter Murphy and John Arrowood. Gov. Roy Cooper thanked the current judges and the former ones in the audience for their commitment to public service. 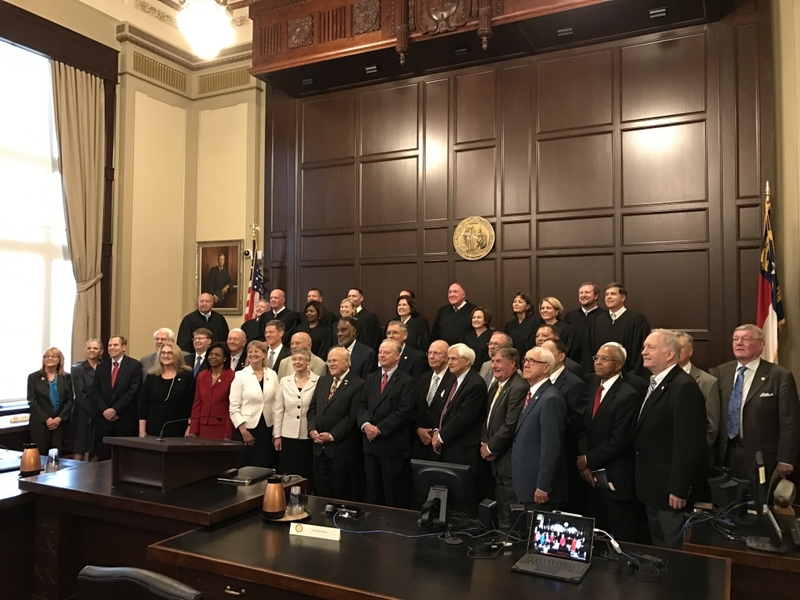 He said it was his deep honor to attend the ceremony and signed a proclamation recognizing the day as the 50th anniversary of the State Court of Appeals. The former judges who spoke recalled how much they loved serving on the court and spoke fondly of the camaraderie on the Court of Appeals. Former Chief Judge S. Gerald Arnold said he learned a lot during his time on the court and spoke of the importance of collegiality and judicial decorum. There was a documentary about the Court’s history shown at the ceremony, and Walter Brock Jr., the son of the late former Judge Walter Brock, was the last to make remarks. Brock said he has a personal connection to both the history and the future success of the court, which was not and is not inevitable. His hopes for the future include that the court remains accessible, friendly and helpful to the Bar, that all the judges, regardless of the size of the court and the workload, make time to enjoy the camaraderie and that the relationship between the Court of Appeals and the state Supreme Court remain solid. The ceremony ended with a dedication of a new judges’ portrait wall.